Whether you’re buying it for your sofa, camper or boat, a replacement mattress is an investment, and as with all investments, you want to protect it. Normal everyday use can wear on a sofa, RV, or boat mattress, shortening its lifespan and decreasing the comfort. These misfortunes can easily be avoided by using a quality cotton mattress pad. The effect one’s body has on a mattress is incredible. You can be the cleanest of people and yet your body can still work against you when it comes to protecting your boat, sofa, or RV mattress. Every night we lose skin, it just flakes off. It’s a natural occurrence, and the flakes end up collecting on our mattresses. They aren’t apparent to the naked eye, but they do supply bed bugs and dust mites with the perfect buffet. Dust mites can cause health problems such as eczema, asthma, and rhinitis. We also tend to lose bodily fluids while sleeping. Sweating is something we all experience from time to time. Incontinence issues can also put your mattress in jeopardy. This is especially true for the elderly and young children. All of these problems can be easily cleaned up when a mattress pad is used, especially if it is waterproof as well. The pad can be washed and put back in place once clean. All dust mites will be killed and odors eliminated. The actual mattress will last longer and remain hygienic, thus protecting your, your loved ones and your guests’ health. Extra tip: using a cotton mattress pad and quality sheets will give you and your mattress an extra protective layer. The ticking that comes on a boat, RV, or sofa mattress isn’t always comfortable enough to sleep on directly. The ticking that it is surrounded by doesn’t breathe well. This is when the use of a cotton mattress pad can make a huge difference. The mattress pad allows the body to breathe as you rest. The result is a much more comfortable sleeping area. You’ll also wake up feeling more refreshed than when using the mattress without a protective covering. If you have ever tried to use a mattress without a pad, you know what it is like to wake up with your sheets and blankets bunched up uncomfortably underneath you, and you might also wake up directly on the mattress ticking. Mattress ticking tends to be slippery. A quality mattress pad stops the sheets from creeping during the night. In addition to keeping the covers where they belong, a mattress pad can provide you with a better sleep by adding another layer of cushioning. 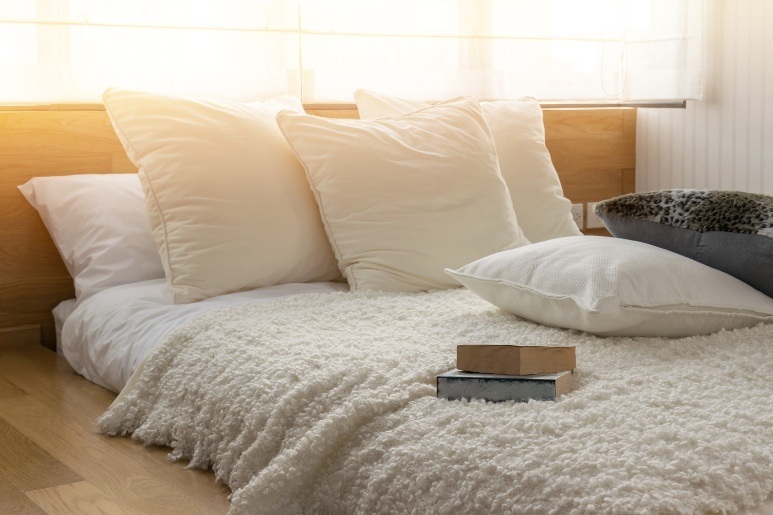 As well as being softer than the mattress alone, a good pad can be an extra layer of insulation, making the mattress feel warmer in cool weather. Also, a quality cotton mattress pad also keeps you cooler during those hot summer nights, whether you’re sleeping in your trailer, boat or on your sofa. In conclusion, we like to think of the mattress pad as a policeman, it keeps your mattress, your health and comfort safe from the “bad guys” 🙂 What is the main reason you would buy a cotton mattress pad? This entry was posted in About Mattresses and tagged How to clean a mattress.